Richard Oberacker and Robert Taylor’s original swing score of the new Broadway musical Bandstand will be recorded onto an original cast album by Broadway Records. The album will be released on June 23. Bandstand, with a book by Oberacker and Taylor, began previews at the Bernard B. Jacobs Theatre on March 31 and will open on April 26. Directed and choreographed by Hamilton Tony winner Andy Blankenbuehler, the musical stars Tony nominee and Broadway.com vlogger Laura Osnes stars alongside Corey Cott. Bandstand follows Donny Novitski (Cott), a singer/songwriter who leads his wise-cracking gang of jazzers to a national radio contest in search of America’s next big swing band. With the young war widow Julia (Osnes) as their singer, the group struggles to confront the lingering effects of the battlefield as they strive for fame and fortune through their music. 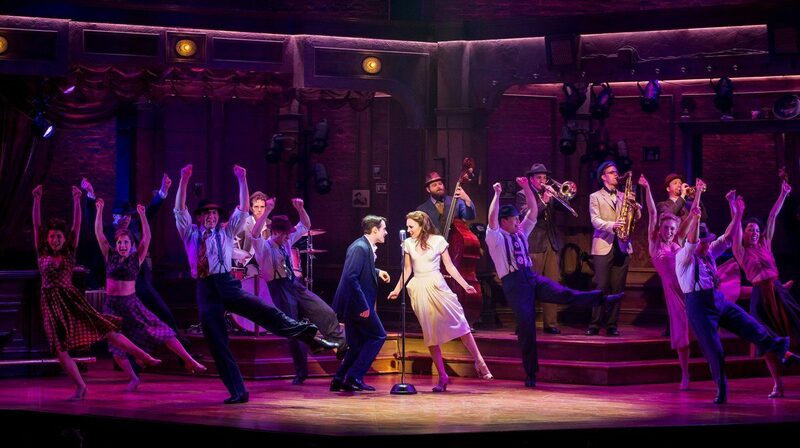 Along with Osnes and Cott reprising their performances from the 2015 world premiere at Paper Mill Playhouse, the musical features Tony winner Beth Leavel as Mrs. Adams with Joe Carroll as Johnny Simpson, Brandon James Ellis as Davy Zlatic, Nate Hopkins as Jimmy Campbell, Geoff Packard as Wayne Wright and Alex Bender as Nick Radel. The ensemble features Mary Callanan, Max Clayton, Patrick Connaghan, Matt Cusack, Andrea Dotto, Marc A. Heitzman, Ryan Kasprzak, Andrew Leggieri, Erica Mansfield, Morgan Marcell, Drew McVety, Kevyn Morrow, Jessica Lea Patty, Becca Petersen, Keven Quillon, Jonathan Shew, Ryan VanDenBoom, Jaime Verazin, Mindy Wallace and Kevin Worley.